and greens provide subtle bursts of color with the elegant Mommy mother's bracelet. The bracelet is finished with hand selected sterling silver accents from Bali and Turkey. 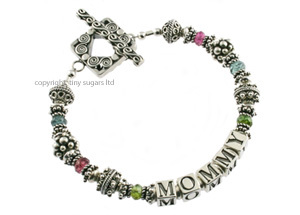 Each Mommy mothers bracelet is created by hand based upon your personal request. number of letters in your jewelry design. wrist size for a slightly snug fit or add 1/2 inch (1.25cm) for a slightly loose fit. (0.6cm to 0.7cm) to my wrist size so that the letters on my mother's bracelet remain on the top of the my wrist. bracelets to have a little more movement. Remember to add 1/4 inch to 1/2 inch (approximately .70cm to 1.25cm) to your wrist size.